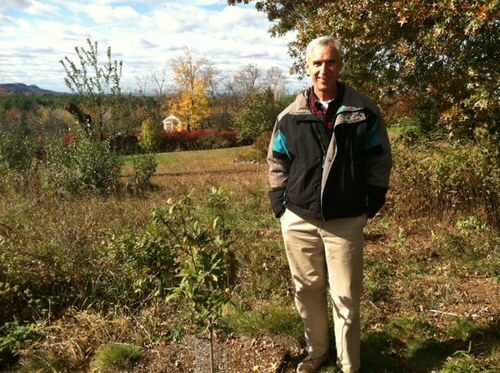 Kent Faerber is a man with a plan--a flexible plan, that is, to create an edible landscape on his 1.25 sundrenched acre in Amherst. I met with Kent at his custom designed home that he and his wife, Scottie, built for their retirement. The one-story modern ranch, with a spectacular view of the Holyoke Range, overlooks Kent's diverse and productive hillside garden of fruit trees, shrubs, brambles, wildflowers and natural vegetation. We met in Kent's study and later toured the gardens and orchard. When did you first get interested in gardening? When we built this house in 2006, we had to do something with the grounds. My wife had a little bit of gardening experience, but I had none. I had to make some decisions on the fly. The house was special, and I wanted the landscaping to be special, too. 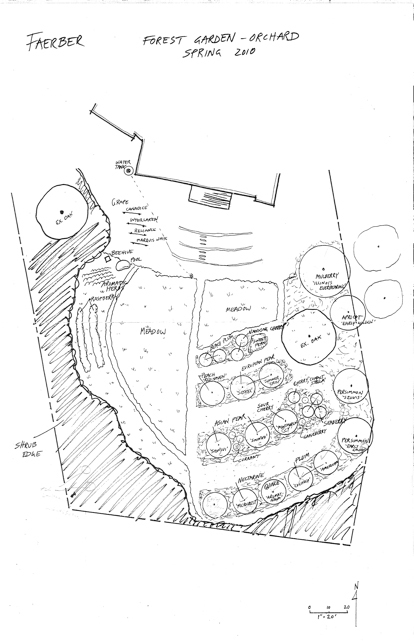 So one of the first things we did was contact the Conway School of Landscape Design that requires every student to do a landscape plan for a real piece of property for a modest fee to the landowner. Through the School I contacted Jono Neiger, a landscaper and teacher there, and he introduced me to permaculture. We needed to phase in the plan he developed. He wanted to put in a lot of edible plants, and we also added witch hazel, mountain laurel, Viburnum, Fothergilla, Rosa rugosa, cherry dogwood, two birches, etc., so we started with that during 2006 and 2007. Why did you decide to become a master gardener? I started to get interested in learning more about gardening when Jono was working here. I retired from the Community Foundation of Western Massachusetts in 2009 and started reading a lot and maintaining what he had planted. Then I took the Master Gardening course in 2011. 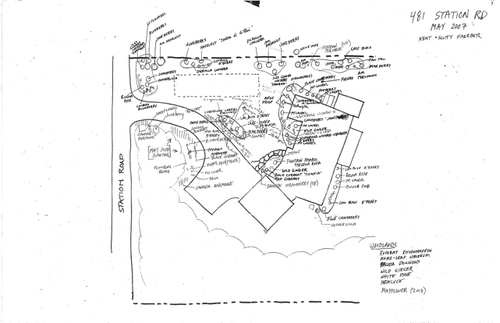 How did your garden plan work out? We started adding a bit at a time, then took a break during the 2008 recession, and in 2009 I told Jono I wanted to plant fruit trees, particularly below where it had been an apple orchard farmed by Atkins. We had saved a few apple trees when we built the house, and I wanted to get going on fruit trees because I wasn't getting any younger. So we did that next. In 2010 Jono planted an orchard down in the field below the house. We got apricot, nectarine, quince, Japanese plums, Asian pears, sour cherry, gooseberries, sweet cherry, mulberry, peaches, European pears, beach plums, Nanking cherries, and sweet fern. We planted some grapes, two red chokeberries, and, later, more pears and another peach. We are beginning to get nice fruit now on some of these. We also planted medlar, which is an old medieval apple tree but with small fruit. The skin of it flares out almost like a fool's cap. Apparently, if you leave it until it gets ripe, it gets mushy like applesauce. It's very slow growing so I got tiny little medlars this year after four years. And we planted a jostaberry. It's a cross between a gooseberry and a currant. After I took the master gardener course, I really got into it and didn't need Jono's help anymore. I've put in more fruit, perennials, annuals, and a couple of yuccas and a cactus on the south side of the house where it is so hot. Now we have peaches, pears, a lot of Asian pears, prolific plums, and the raspberries are still producing in late October. We also planted pawpaws that don't self-pollinated, and not many pollinators like them. So the first year I went out there with a paintbrush, and it worked! But this year I got fruit and didn't do it. So somebody else is doing the job! One of things I like about it is that it's such a beautiful tree, and the fruit is interesting. Pawpaw is called "the poor man's banana" which tastes like a cross between a melon and a banana, and has beautiful large black seeds. It's native and has been quite productive for us. What are you using your fruits for? We eat it fresh, and make wonderful jellies. I have a lovely quince tree that yields these grapefruit-size fruits. In fact a neighbor came by this morning with quince liqueur and some quince butter she made from fruit I gave her! The liqueur needs to ferment about three weeks in the sun. You make it with vodka, and after it ferments, you strain it through cheesecloth and add Chardonnay to mellow out the flavor. How are your grapes doing? Not very well for two reasons: not enough sun and Japanese beetles. I have a week every year when I go away with friends sailing, and that is when the Japanese beetles come! Also, the afternoon sun is shaded by some big trees. So I plan to move them to where they will get more sun next spring. I also think I need to get some new grapes from another source. I try to use as little chemicals as possible. I hand weed, but have used Round-Up on the poison ivy. I pick off the beetles and drop them in soapy water. The beetles like the Rosa rugosa and hazelnuts, too. Do you plant for wildlife as well? Yes, especially after going to the Upper Valley Spring Symposium last spring and hearing the keynote speaker, Doug Tallamy, author of Bringing Nature Home. I've planted butterfly weed and collected and planted the seed. I have quite a bit of wild milkweed and goldenrod around. We leave it to grow wild between the plants and trees. We just cut it once a year. We get a lot of birds--bluebirds, goldfinch. I saw an indigo bunting this summer, and the hawks and owls perch up in the tall trees and hunt mice and voles in the orchard. You are a beekeeper, too? How did you get interested in that? We had a guest who brought us a gift of homemade honey, and I got kind of interested. In 2010 I contact Dan Conlon of Warm Colors Apiary and took his class and bought Italian bees and all the gear. The Italian bees are the most gentle, but they are also the weakest. Well, in their defense that summer was one of the driest in a long time. So it was hard for them to collect nectar to get them through the first winter, and the winter was one of the longest and snowiest. I lost one of the queens during the summer. So I had to re-queen the hive. That was pretty unusual, but they were weak from the beginning. They got chalkbrood during the following wet spring and never produced anything that second summer. In 2012 I decided I was going get some new colonies, and Al Carle at the Amherst Farmers' Market, who is one of the state apiary inspectors, suggested I get some Buckfast bees from a place in Holliston. I did, and they just took off! The very first year I got 68 pounds of honey. They produced what they needed, and I got the surplus. These Buckfast bees are very focused and energetic! They got through the winter, but the hives got so big they swarmed. The queens left with the foraging bees. This was a problem because the foraging bees are the ones that bring nectar to the hive. Other bees are house bees that clean and guard the colony, for example. I found one of the swarms and captured it and gave it to Russ Billings, another Master Gardener who is the Greenhouse Manager at Mount Holyoke. In the meantime my colonies produced new queens. So both of those hives are now giant hives, and I got 52 pounds of honey from those even after the swarm. So that's going well. Next spring I think I'll divide the colonies and put on another box so they don't swarm again. Maybe I'll get 100 pounds of honey! I don't know what I'll do with it all. What do you use as a watering system? I have a 300-gallon rain barrel and a self-installed drip system with drip emitters. It got me through the dry summer in 2010, but I had to fill the rain barrel a couple of times. I also have another system for the perennials and herbs in front of the house that I hook up to my hose. It's too far from the rain barrel. With the great southern exposure, I see you are also using solar energy. How are you doing that? I installed a photovoltaic array on the roof that, and with WMECO's net metering system, it has brought our yearly electric bill to zero. I also installed a solar domestic hot water system that provides most of our domestic hot water from April through September. Plus we have large triple-glazed windows facing south to the Holyoke Range, some extra insulation, and a connection to natural gas (for heating, hot water, and cooking). So the total utility costs are under $1,000 per year. The power of the sun is awesome!